A German site has released details of how they repaired a set of Mission 753 Loudspeakers that were sporting a blown tweeter. Visitors to Justblair.co.uk frequently contact me for advice on how to deal with blown tweeters on the Mission 753 Speakers, it seems that the tweeters are the least resilient to party type abuse! As the speaker is about 15 years old now, unsurprisingly the tweeters are no longer available as replacement parts. This leaves the owner with two choices, either find a specialist who can rewind the melted voice coils or find an alternate part that will play nice with the bass drivers and crossover. When asked to repair a set of Mission 753’s Hifi Selbstbau took a methodical approach to find drivers that would make a good match to the speakers. Bruce Heron was looking to simplify the process of testing and prototyping his Tube designs. When testing designs, a solder-less breadboard is a fantastic tool, for the hobbyist. 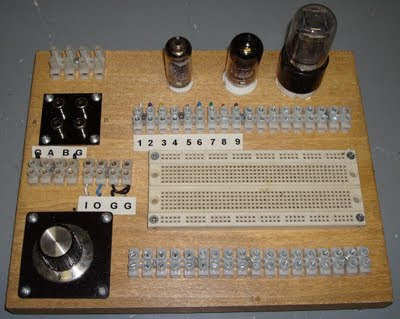 However I have never seen one that was either durable enough or indeed that has the correct connector layout to take a vacuum tube. What Bruce did then was to layout a wooden board with the required connections for his tubes, a breadboard and other required components. The board has connectors for inputs an a variable resistor. Chock blocks are supplied for routing and components. This is an interesting project that won a Microchip sponsored contest recently in the Subcategory – Effective Use of SMPS Resources. Named the MiniTron, designed and built by George Anderson (of tubelab fame) this amplifier blends the old with the new in a manner that fans of the various technologies just might class as sacrilegious! The DSO Nano from SeeedStudio is a cheap but useful, portable colour digital storage oscilloscope. As you can tell from my previous review, I was pretty impressed with this budget scope. For the price that Seed studio are selling it for, it offers excellent value and a highly practical device. However, costs have to be cut somewhere to reach that $89 price point that Seed have achieved and one look at the standard probes tell you that Seeed did not burst the budget on these items. So what can you do when you inevitably end up breaking the flimsy 1x probes that are supplied with your Nano? Luckily it is a pretty easy job to modify a 10x probe readily available on the internet. Not only that their are additional benefits a plenty to be had from this modification. Seeed Studio it would appear have an instant hit on their hands with the DSO Nano. As you me be aware I was one of the quick that managed to snag one of the first prototype units for review. Well demand is clearly going through the roof. Seeed announced they had prepared a further 100 units this weekend and sold them out in 24 hours. They have just a handful more of the “pioneering” batch to sell and then they are changing the design to a more mature production design. Differences in the production models are designed to make manufacture easier. If you are in a real hurry for a DSO Nano then keep your eyes peeled on the Seeed Studio Site, when they release the next 100 competition will be tough. As the DSO Nano is an open source project, Seeed are intending to release the API shortly, this can only increase demand! Over at 41Hz Audio they feature some of their customers completed projects. This one caught my eye, simply because of the simplicity of the design. Sébastien has used their Amp 1 kit and squeezed it into an aluminium project box that has been very nicely prepared. A friend of his has drilled and painted it using Automotive spray paint. In the photograph the paint finish looks very good to me. Considering the project box only cost 17€, and an amp 1 kit can be had for 33€ this project is reasonably priced. I stumbled upon this beautiful project whilst browsing the web today. This restoration by Greg Charvat takes a very ornamental and indeed ancient Console Radio and sympathetically brings it back to life. The temptation with projects like this is to replace on a wide scale components with new parts. However Greg has kept some of the original capacitors, all of the original resistors and more. I have to admit that I am looking for a restoration project for myself… It seems though that so is everyone else. E-bay auctions seem to go skywards for any interesting vintage tube amps… Ahhh one day! SparkFun Electronics Hits Legal Problems with Bully SPARC International Over Trademarks.